The Beluga White wall lamp is the perfect lamp for lighting of paintings, mirrors or wall elements. A modern, minimalist design makes the wall lamp to many premises compatible and emphasizes the flexible nature of the design. The Frenchman Marc Sadler designed the Beluga wall light in 2011 and donated it the new white finish. Fabbian offers other variants of the Beluga White, which you can visit at the bottom of this article. The long arm of the lamp in chromed metal leaves the White Beluga rise up to 45cm into the room. 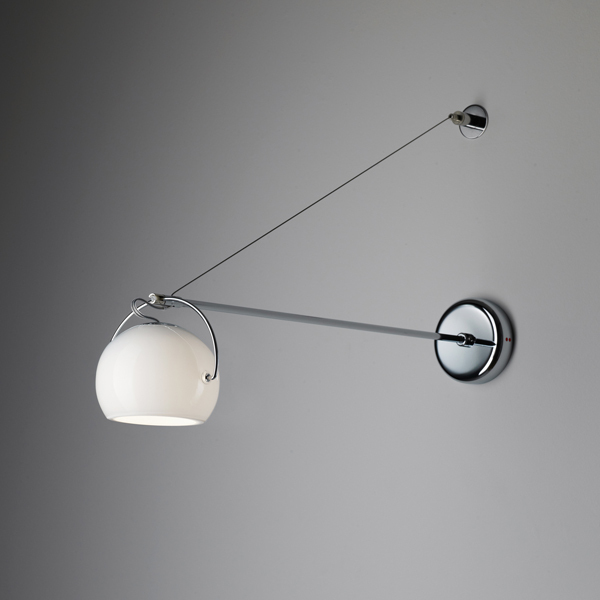 The shield of the Beluga White wall lamp movably suspended in the suspension and is adjustable in its vertical position by the handle. So you can focus the desired point of illumination as desired and can thus vary the light atmosphere easily. The Beluga White wall lamp works with a bulb with the popular G9 version. This can be - unless it is stated otherwise in the bulb - with the help it adapt external dimming in the light output.